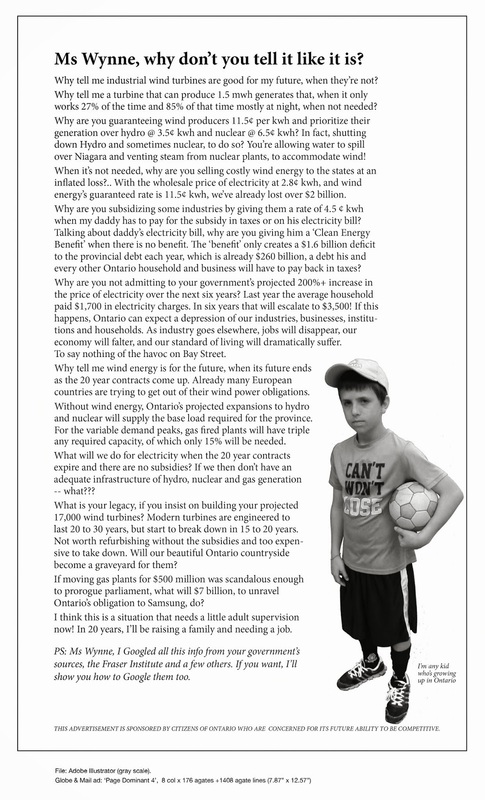 “You are harming us.” | Mothers Against Wind Turbines Inc. Weekend on the farm? Or a visit to a power plant? Victoria Day weekend in Canada is a time for picnics and fun with family and friends, for many people. One set of grandparents living on a farm in Ashfield-Colborne-Wawanosh Township in Huron County thought that would be fun too, and were looking forward to having their two young granddaughters come and stay for a lovely weekend in the country. Later on that same morning, she said, she had “severe pressure and pain” in her ear. Then, “Our eight year old granddaughter complained of a ‘sore forehead’.” The child has complained of sore ears at times in the past while visiting her grandparents’ home, but never at any other time. Outside, the family discovered, the whining and whooing noise was everywhere. “We had to leave here [our home] with those little girls,” the grandmother said. The family, who wishes to remain anonymous, like so many other families forced to endure the noise and vibration from wind turbines. They live with 11 wind turbines within two kilometres of their home, the closest of which is just over 700 metres from the house. Ontario Minister for the Environment and Climate Change Glen Murray recently promised in the Legislature that his staff were responding to such complaints and that they would ensure the rules on noise emissions would be enforced. Ontario families who did not ask to be exposed to these noise emissions deserve to have the Ministry fulfill its mandate, and protect all citizens from harm. Pure tones are wave forms that occur at a single frequency. Tonal noise is generated by rotating equipment at a predictable frequency relating to the rotational speed of the shaft and the number of compressor vanes, fan blades, engine pistons, gear teeth, etc. For the past two years, even residents who are still unaware of what is causing their psychological and physical symptoms, are unconsciously fleeing their homes, when the atmospheric conditions and wind speeds are such that their nervous systems are being bombarded with infrasound. The’ flight or fight’ response causes them to suddenly make decisions to get away from their homes. Peacefully relaxing at home and enjoying the day is not possible. When headaches and cardiovascular symptoms are happening, it’s unsafe to get in a vehicle and drive. In the middle of the night, especially in the winter, people should not be out on the roads in Huron County, trying to escape the harm. Inviting guests to one’s home and taking the risk that they could be harmed while visiting becomes a deterrent to maintaining one’s normal social life with family and friends.